Question: If an employee refuses to participate in the accommodation process but clearly can't do her full duties, what process should the employer follow before it gives up and dismisses the employee? Answer: As is well-established, employers have a duty to accommodate the disability of an employee to the point of undue hardship, unless it can show that there is a bona fide occupational requirement that would prevent it from doing so. 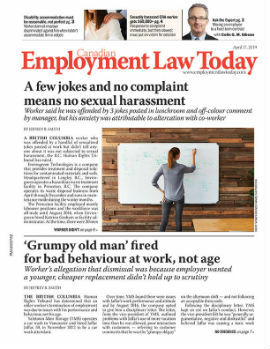 While privacy legislation, as well as human rights laws, restrict the amount and type of medical information that an employer can require from the employee, it is well-established that the employer is entitled to understand the limitations upon the employee's ability to carry out her work-related duties. In other words, the employer is entitled to fully understand the need for accommodation so that it can assess the viability of providing accommodation, as well as the options for doing so. The accommodation process is intended to be a two-way dialogue between the employee and the employer (or a three-way dialogue that would include a union if one is present). Employees are not entitled to make a request for accommodation and then refuse to participate in the process.